12 weeks is a busy time of your pregnancy, from 11 to 13 weeks generally an ultrasound scan is performed to measure the nuchal translucency (NT), the thickness of fluid-filled tissue at the back of the fetal neck. 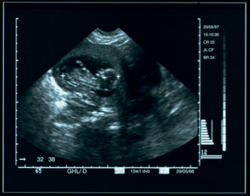 This scan is referred to as the NT Ultrasound. This scan is part of the prenatal screening tests for Down syndrome and other conditions. The NT Ultrasound simply assesses and calculates the risk of Down syndrome as part of a combined test and is not a definite diagnosis. The measurement of the translucent area is calculated in combination with the blood test called first-trimester maternal serum screening (MSS) and the woman’s age to give a level of risk assessment. Your doctor will give you further information regarding the prenatal screening tests which will explain in further detail about the test, risks, results and options. In addition to your 11 to 13 week ultrasound you will most likely be encouraged to book in for your 18 to 20 week scan. Although the ultrasound can be performed at any stage during the pregnancy it is usual practice to offer pregnant women an ultrasound scan at 18 to 20 weeks of gestation. This scan is a general assessment of the fetus’ physical development, the size and well being of the fetus, the location of the placenta and amount of amniotic fluid. It is also the perfect time for finding out the gender of your baby! Your baby bends its arms and legs and jerks his body; however it is still too early to feel any movement; the baby will begin to move around much more vigorously. Fingers and toes are growing very rapidly and becoming fully formed, fingernails will begin to grow. The ever important sucking reflex is becoming more established and the baby purses its lips, wrinkles its forehead and turns its head. The baby swallows amniotic fluid that it floats in at a comfortable temperature of 37.5 degrees Celsius (which is actually higher than your body temperature) and also excretes the fluid as urine. The placenta is developing, there is a rich network of blood vessels that provide the baby with all the nourishment it needs. The umbilical cord has three blood vessels that all perform their own tasks. It is now completely mature with a large vein to carry nutrients and oxygen-rich blood to the baby. The two smaller arteries carry the waste products from the baby back to the placenta. Rest assured that the cord is like a spring in a coil so that there is plenty of room for the baby to move without risk of hurting the baby. In fact in one of my own ultrasound photos the umbilical cord can be seen thrown over the baby’s shoulder, it’s like the baby is wearing it as an accessory. The baby’s intestines that started developing in the umbilical cord are now beginning to move into the abdomen cavity. The crown to rump length of the baby is now approximately 60 to 65 mms long and weighs about 14 grams, growing rapidly every day.